يضمن فندق MainIslander on the Beach Island Holiday Propertie الذي رمم في 2011 لزائريه قضاء وقت ممتع في راروتونجا، سواء جاؤوا في رحلة عمل أو سياحة. يمكن من هنا للضيوف الاستمتاع بسهولة الوصول إلى كل ما تقدمه هذه المدينة النابضة بالحياة. سوف يعشق النزلاء موقع هذا الفندق، فهو قريب من أهم المعالم السياحية في المدينة كمثل Wigmore's Superstore, Turoa Beach, ‪Maire Nui Botanical Gardens‬ . يقدم MainIslander on the Beach Island Holiday Propertie خدمات لا غبار عليها وكل أشكال اللياقة وحسن الضيافة اللازمة لإسعاد ضيوفه. لضمان راحة ضيوفه، يقدم الفندق الخدمات التالية: واي فاي في المناطق العامة, صف السيارات, التوصيل من وإلى المطار, خزنة فولاذية , تأجير دراجات هوائية . تنعكس أجواء MainIslander on the Beach Island Holiday Propertie في غرف الضيوف.تلفزيون بشاشة مسطحة, غرف لغير المدخنين, مكتب, شرفة/ تراس, مروحة هي بعض الميزات الموجود في العديد من الغرف. يقدم الفندق مجموعة رائعة من الخدمات كمثل شاطئ خاص, حديقة، لجعل إقامتك تجربة لا تنسى. إن MainIslander on the Beach Island Holiday Propertie هو خيارك لخدمة الفنادق الراقية في راروتونجا. We were hoping on a house direct on the beach, and where a bit disapointed when it was on the other side of the mainroad. But after the first night we agreed upon that this was the best choice. We hade peace and calm. The only thing thing that anoyed us where the roosters. But that is just exotic. We had good service of the owner, and had housekeeping three times a week. It was nice to sit out on the portch at night. All in all this is close to paradise. came for a work trip and was upgraded to the main islander property 1) opposite side of the island from avarua. ~25 mins by bus..still only 16km and not hard to bike (its all flat) back to avarua 2) simple basic kitchen well stocked with pots/pans/dishes, but very few basic things (outside of salt/pepper). luckily walking distance to a local grocery store...most basic things there so can put together a yummy meal. 3) 2 bedrooms--both overlook the lagoon...i was there in fall and it was temperature wise quite nice with the windows/fan 4)situated basically next to two other properties...and a little further up the beach a beach resort...which means there are very few people...i basically felt like i had a private beach with a private lagoon...snorkeled daily (equipment a bit subpar but functional...no flippers but not really necessary since you can kind of float around tons of reef/fishes without going very far and not dealing with much of a current. good kayak :-)...i rarely saw other people on the beach. can walk in both directions for a few km and still only see a few people. 5) nearby not many restaurants...again, goes with #4..but there was a nice restaurant up on the beach about an 8 minute walk from cottage and a restaurant at the resort that was about a 2 minute walk away. 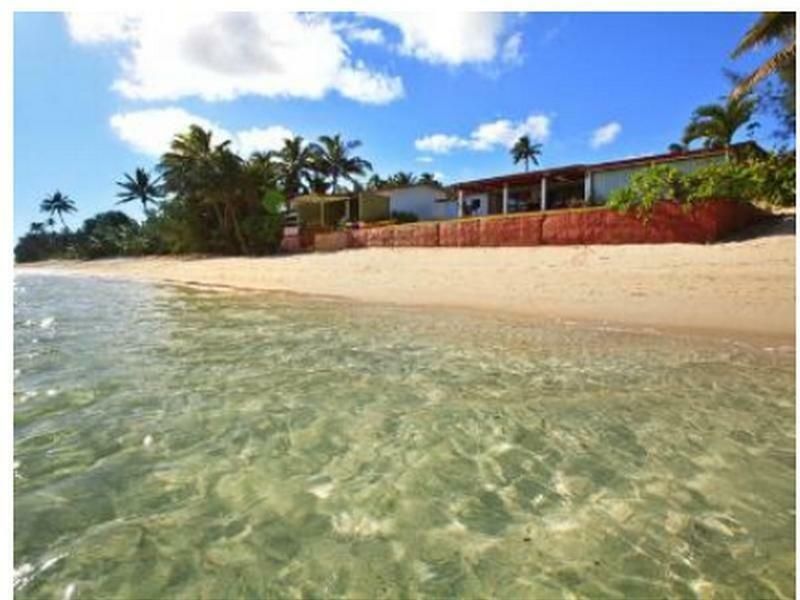 6)pick up/drop off no problem 7) overall, beautiful location, nice property, and the kitchen definitely helped keep the budget reasonable since even just eating breakfast at home saved a ton (things are pricey in the cook islands).